After that big rush of excitement of getting supplies together, and finding a sketchbook, often come the big questions. Where, and what shall I journal? There’s just so much to draw and record out there! Once you begin to notice nature in a different way it’s a little overwhelming, especially when you go outside to journal for the first time. Where do you start? You may have heard the expression ‘sit spot’. This is an interesting spot in your journaling patch, which you return to time and time again. But how do you choose one, and how can it help you? Using your sit spot as a focus is a really useful way to help you work up a journal page! Think small - to maximise your spot! To choose a spot, don’t feel you have to walk, or drive miles. Just find a safe, green area you can get to easily. A garden or the local park is fine. All that matters is that it attracts and interests you! Now, forget the rest of the area for a while and just concentrate on your chosen patch or subject*. Remember - take small steps! Get yourself as comfy as possible. Think about what attracted you to the spot. Write the date and make some notes in your journal (remember my Ten Minute guide to getting started? ) Get some helpful marks on that pristine white page! What shape are the leaves, or needles? Are they green, gold, red, something else? Are there fruit, nuts, berries - or old seed cases on the ground? Does it trigger any other responses, thoughts or memories? Use your prompts to help you make some small drawings like the ones I’ve sketched below. Focus on small things like twigs and leaves, and sketch whatever bits interest you. Don’t worry about sketching the whole tree - although if you feel brave, just go for it! Here I focused on on of my favourite trees. 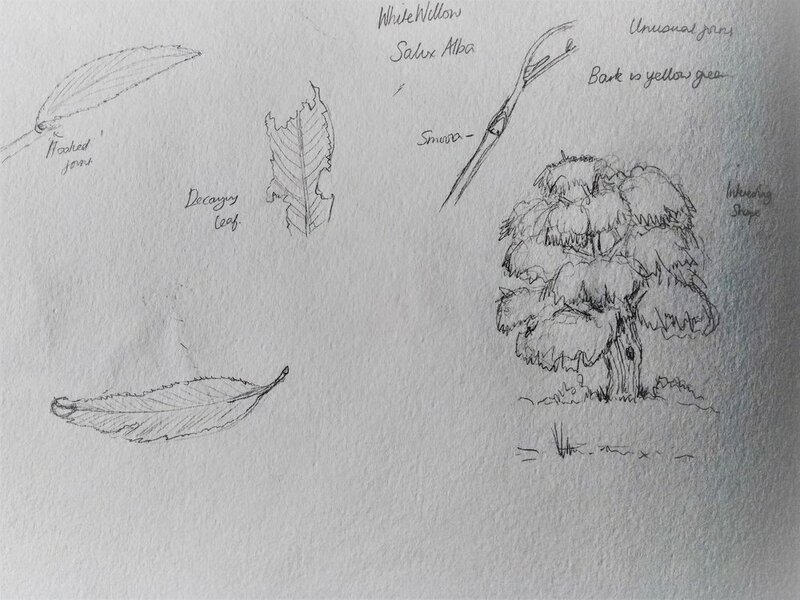 First, I made several small drawings - quick pencil sketches and notes of the things which interested me about this lovely old willow on the marsh. I didn’t worry about placement, or making the page look pretty; but I made sure I’d left space for writing. Then I then added some colour to the sketches before finishing off writing up my notes - and doing a bit more research about the willow family. Going small scale takes some of the pressure off, and concentrating through your sit spot can really help you focus. Try and revisit your spot at different times of the day, and in changing weather conditions. You’ll find out so much more about its nature story. By beginning to journal outside with this approach your knowledge and confidence will soon grow - and so will the size of your journaling patch! *This works really well if time is short, or you are journaling with little ones.